We’re Somewhere Between 90th and 99th Percentile. You, I Don’t Know. 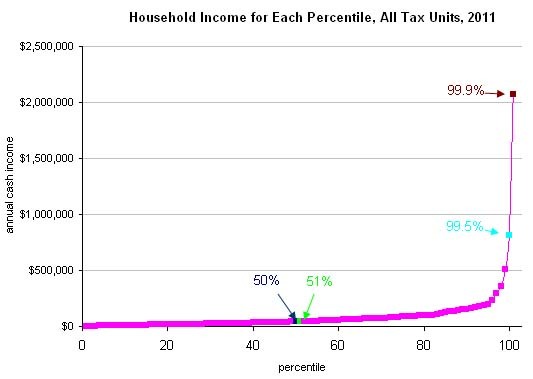 “Where Do You Fall on the Income Curve” states “the difference in incomes between a household at the 98th percentile and the 99th percentile is $146,118 ($360,435 jumps up to $506,553).” Mind you, that’s the difference between just the 98th and 99th percentile of household income: “the difference in income between a household at the 50th percentile and a household at the 51st percentile is $1,237 ($42,327 versus $43,564).” “We are the 99%” is short, catchy, and sounds relevant, while being useless as a platform to actually do anything. Posted on December 9, 2011 Categories Constitutional Law, SpeechTags economy, Occupy Wall Street4 Comments on We’re Somewhere Between 90th and 99th Percentile. You, I Don’t Know. In the typical U.S. workplace the employer owns the computer network, which it supplies to employees exclusively or primarily for work-related purposes. Employees generally receive little privacy protection in their workplace email and Internet activity. This article from The Privacy Advisor discusses a recent decision by the Israeli National Labor Court that expands employee privacy in the workplace and establishes a nuanced framework to guide future cases. The article’s author says the decision demonstrates “a general trend of increased sensitivity by the courts outside the U.S. to e-mail privacy.” The decision obviously does not bind any U.S. court, but it does provide a lens through which to evaluate our blunt-instrument approach to these issues. We will see whether U.S. courts join this general trend.